The RMR limestone quarry looms in the background, as seen from the Glenwood Caverns Adenture Park in this April 2018 file photo . 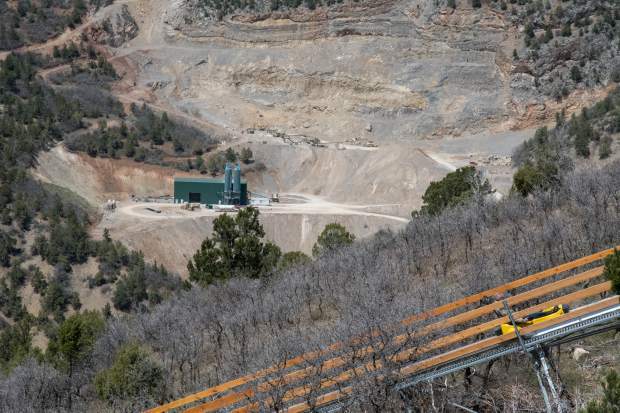 The Bureau of Land Management has authorized a controversial limestone quarry north of Glenwood Springs to drill 15 exploratory holes to search for additional mineral resources, prompting concerns about a lack of public involvement in the federal agency’s decision-making process on the controversial quarry. Rocky Mountain Resource Management (RMR) has begun exploratory drilling after the BLM order dated Oct. 12 authorized “up to 15 drill holes, each no more than 200 feet deep, within three possible areas inside the existing disturbance of the quarry,” to search for dolomite. The Glenwood Springs Citizens’ Alliance (GSCA), which a community group formed to fight a planned quarry expansion, is concerned that the BLM is keeping the public in the dark, and questioned BLM’s reason for bypassing a more extensive study of the impacts of the exploratory drilling. The BLM’s decision, known as a “categorical exclusion,” gives justification for approving the exploratory drilling without full review and public comment, as required under the National Environmental Policy Act (NEPA). BLM’s rationale for bypassing the more complete study is categorized as “Digging of exploratory trenches,” which struck a GSCA’s attorney as a “preposterous” way of describing 200-foot-deep drill holes. “Small-scale trenching is not the same as 15 deep boreholes,” Roger Flynn, director and managing attorney for the Western Mining Action Project, which represents GSCA, told the Post Independent. “BLM does not have a categorical exclusion for deep drilling like this, so they had to come up with some way to avoid public review. And they came up with this, on the face, illogical and really preposterous excuse,” Flynn said. When considering categorical exclusions to the NEPA process, BLM looks at the impacts associated with the proposed action, according to Gloria Tibbetts, acting field manager for the Colorado River Valley Field Office, who signed the Oct. 12 decision. The 15 holes in three locations had a similar surface disruption to digging trenches, according to Tibbetts. “Trenches is one way to describe it, but the holes fall under that overall umbrella,” Tibbetts said. The BLM allows 30 days to appeal the categorical exclusion decision, and the Interior Board of Land Appeals can choose to place a stay on the actions. The GSCA has not submitted an appeal. “We’re keeping our options open,” Flynn said. Given the public interest in the quarry, GSCA member Sumner Schachter believes the BLM should have done more to involve the public. “BLM should be allowing public review of all permit modifications at the site — not shielding RMR’s activities from the public’s eyes,” Schachter said in a statement. “It’s already part of the disturbed area, within the permitted area, so that falls completely in the regulations to do a categorical exclusion,” BLM spokesman David Boyd said. RMR began the drilling operations last week, according to Boyd. A spokesperson for the company did not return a request for comment. “As we move forward with the larger proposal for the quarry expansion, we’ll definitely have well-advertised opportunities for the public to be involved in that decision,” Boyd added. Currently, RMR is permitted to mine and sell limestone under a fairly restrictive category of federal regulations, Flynn said. Dolomite rock, which is used in construction, particularly as an aggregate for asphalt, as railroad ballast, and in the production of cement, is subject to a different category of mining laws, he said. “It appears the company is looking for other minerals at the site, even though that is not what they were permitted for,” Flynn said. The approved drilling does not mean the BLM has permitted RMR to quarry any other materials, or that the mine is allowed to expand, Tibbetts said. The decision to allow drilling “in no way authorizes any expansion,” Tibbetts said. As the Post Independent has reported, RMR is interested in expanding its operations. The RMR quarry is still not under compliance with the current permit that restricts mine operations to 15.7 acres. The quarry was operating on a greater area than permitted when RMR took over in 2016, Tibbetts said, and though the area has not expanded since then, it also hasn’t shrunk.